Ultrasonic waves can be used to detect the phase of liquid/solid mixtures of various fats and oils. The methods generally rely on the enormous dynamic range and broad spectral response of the system. As a fat material solidifies the attenuation per unit length tends to increase very rapidly. For conventional ultrasonic gear the limits are quickly reached. The practical range of measurements is nearly useless. With our SIA-7 the dynamic range and signal to noise ratio is so great that even at high solid fat contents the system is easily able to make fast and accurate measurements of solid fat content in real time over large distances. Previous work with solid/liquid fat measurements using ultrasonics has been unsuccessful at fat contents exceeding 10%. A review of the work suggests most of the troubles were related to problems simply getting a signal through the material in contact mode. The experiments are generally done using simple pulser receiver combinations and an oscilloscope. The SIA-7 is a much more sophisticated system with far greater dynamic range and capabilities. Propagation of ultrasound through solid fat (>50% solid fat content) was easily achieved even in air coupled mode. Using contact ultrasonics probes extended both the range and accuracy of the measurements. A number of detailed studies were done to demonstrate the effectiveness of ultrasonics as a means of characterizing solid fat content in practical on-line environments. The application must also be simple and effective. Although the SIA-7 is a sophisticated ultrasonics tool it can easily be configured to operate in a stand alone mode. The SIA-7 becomes the ultrasonics black box that does all the difficult tasks. The user interface can be so simple that it just displays the solid fat content. Ultrasonics is readily adaptable to production line equipment. Instead of waiting hours for feedback from a quality control lab ultrasonics can provide real time information. Timely feedback improves product quality and lowers costs. Three different configurations of the Ultrasonics Analysis system are offered. A small lab system designed for proof of concept and evaluation. This system is small and simple designed to help correlate the measured ultrasonic parameters with the material properties. The system includes a small sensor head suitable for immersing in the liquid material or an optional flow through head to simulate a production environment. An ultrasonic sensor head can be added to a production line to provide real time feedback regarding the chemical or phase content of a product. Real time feedback can compliment QC lab measurements to help improve quality and minimize product loss. There is growing interest in a variety of food products and applications. One particularly useful application is sonocrystallization. Commercial sonocrystallization units are already on the market. These systems are used to ultrasonically induce chemical reactions to speed up the process and improve the quality of the product. One critical issue especially in solid fat materials is the heating associated with the high power ultrasonics. Adding VN Instruments ultrasonic analysis tools can provide instantaneous feedback capability. The sonocrystallization process can be actively monitored to control and minimize energy consumption and assure correct processing of materials. In a practical installation the product is monitored before and after the processing loop. The power input to the sonocrystallization unit can be actively controlled to provide just enough processing without causing thermally induced damage. 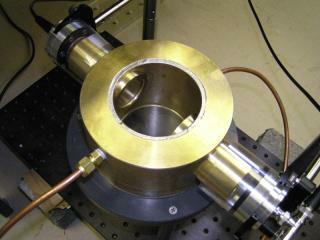 In a practical system configuration, an SIA-7 ultrasonics analysis system is connected to a sensor head. The sensor head operates in a process environment. The SIA-7 performs all the work associated with generating, receiving and processing the ultrasonic signals. An external PC (or PLC) can be used to read the analyzed data and display required results. The SIA-7 is self-contained and handles all aspects of the ultrasonics automatically. No operator intervention is needed. The external controller talks to the SIA-7 using a simple text based language. This allows fast and simple customization of the application. Martini, S., Bertoli, C., Herrera, M.L., Neeson, I. and Marangoni, A.G.
An ultrasonic technique was developed to study the crystallization process of edible fats on-line. A chirp wave was used instead of the conventional pulser signal, thus achieving a higher signal to noise ratio. This enabled measurements to be made in concentrated systems (~20% of solid fat content) through a 8.11 cm thick sample without significant signal loss. Fat samples were crystallized at 20, 25 and 30 °C at a constant agitation rate of 400 rpm for 90 min. The crystallization process was followed by ultrasonic spectroscopy and low-resolution pulsed nuclear magnetic resonance spectrometer (p-NMR). Specific relationships were found between ultrasonic parameters (Integrated Response, Time of Flight and Full Width Half Maximum) and solid fat content (SFC). Time of Flight (TF), which is an indirect measurement of the ultrasonic velocity, was highly correlated to SFC (r2 > 0.9) in a linear fashion (TF = 56.60 – 0.1013 SFC).